For those of you who made the trip to Raleigh last year, it's time for payback at the Nip. We need to show our team that we are behind them prior to our Bearcats taking the field at 8pm on ESPN. 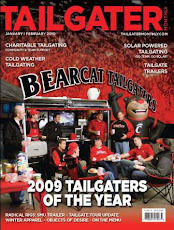 Given all the talk of conferences etc, let's show the ACC how we do things in Cincinnati. Join us around 6pm to watch the team as they make their CatWalk to the stadium, we plan to get the party started around 5pm. Our normal food crew is unavailable tonight so please bring a dish to share with the group, we will have plenty of drinks on hand. A reminder that we are now on campus (more info here). We appreciate donations to offset our costs, find the donation slot on the trailer next to the beer tap. 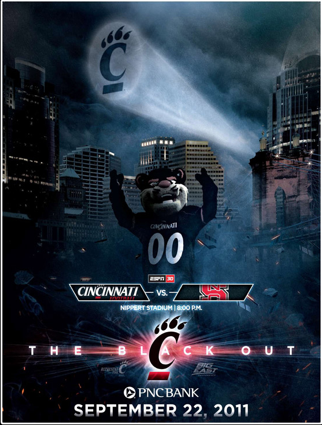 The first 10,000 fans get this limited edition poster, THIS IS A BLACKOUT GAME!